Incretin-based therapies improve glycaemic control in patients with type 2 diabetes. In animal models of diabetes, glucagon-like peptide-1 receptor agonists (GLP-1RAs) increase beta cell mass. GLP-1RAs are also evaluated in non-diabetic individuals with obesity and cardiovascular disease. However, their effect on beta cell mass in normoglycaemic conditions is not clear. Here, we investigate the effects of the GLP-1RA liraglutide on beta cell mass and function in normoglycaemic mice. C57BL/6J mice were treated with the GLP-1RA liraglutide or PBS and fed a control or high-fat diet (HFD) for 1 or 6 weeks. Glucose and insulin tolerance tests were performed after 6 weeks. BrdU was given to label proliferating cells 1 week before the animals were killed. The pancreas was taken for either histology or islet isolation followed by a glucose-induced insulin-secretion test. Treatment with liraglutide for 6 weeks led to increased insulin sensitivity and attenuation of HFD-induced insulin resistance. A reduction in beta cell mass was observed in liraglutide-treated control and HFD-fed mice at 6 weeks, and was associated with a lower beta cell proliferation rate after 1 week of treatment. A similar reduction in alpha cell mass occurred, resulting in an unchanged alpha to beta cell ratio. In contrast, acinar cell proliferation was increased. Finally, islets isolated from liraglutide-treated control mice had enhanced glucose-induced insulin secretion. Our data show that GLP-1RA treatment in normoglycaemic mice leads to increases in insulin sensitivity and beta cell function that are associated with reduced beta cell mass to maintain normoglycaemia. The online version of this article (doi: 10.1007/s00125-013-2957-2) contains peer-reviewed but unedited supplementary material, which is available to authorised users. Glucagon-like peptide 1 (GLP-1) is an incretin hormone secreted by intestinal L cells in response to ingestion of carbohydrates and lipids . 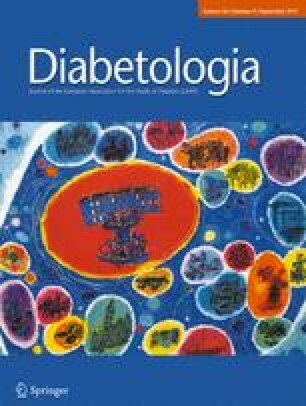 Activation of the GLP-1 receptor (GLP-1R) on pancreatic beta cells leads to glucose-dependent insulin secretion and improves glycaemic control in patients with type 2 diabetes [2, 3]. In animal models of diabetes these therapies increase beta cell mass [4, 5, 6]. The beta cell mass is tightly controlled in order to keep glucose levels within a narrow range. When the demand for insulin is chronically increased by physiological or pathological changes, such as pregnancy or obesity, there is an increase in beta cell function and/or beta cell mass [7, 8]. When the demand for insulin decreases, for example postpartum, the beta cell mass reverts to its original capacity . Besides their effects on beta cells, GLP-1R agonists (GLP-1RAs) exert several extrapancreatic effects that may be of therapeutic benefit. GLP-1RAs decrease body weight and are associated with reduced blood pressure, improved lipid profiles and improved endothelial function in patients with type 2 diabetes [10, 11]. Therefore, these compounds have also been evaluated in non-diabetic individuals with obesity or cardiovascular disease [12, 13, 14, 15]. However, the effect of GLP-1RAs on beta cells in these normoglycaemic conditions is not clear. Therefore, we investigated the effects of GLP-1RA treatment on beta cell mass and function in normoglycaemic mice. Male C57BL/6J mice, 8–9 weeks old (Charles River Laboratories, Wilmington, MA, USA), were housed under standard conditions with a 12 h light/dark cycle and free access to food and water. Mice were fed a normal diet (control; 10% of total energy intake derived from lard fat, 16.3 kJ [3.9 kcal]/g; D12450B, Research Diets, New Brunswick, NJ, USA) or a high-fat diet (HFD; 45% of total energy intake derived from lard fat, 19.7 kJ [4.7 kcal]/g; D12451, Research Diets) for 1 or 6 weeks. Average food intake was determined weekly per cage housing three or four mice. Liraglutide (0.1 mg/kg, Novo Nordisk, Bagsvaerd, Denmark) or PBS was given twice daily with at least a 10 h interval between subcutaneous injections. Treatment was discontinued 1 day before the animals were killed. Body weight was determined after overnight fasting. Animal experiments were approved by the institutional ethical committee on animal care and experimentation at the Leiden University Medical Center. Insulin tolerance and glucose tolerance were assessed after 6 weeks of treatment. An intraperitoneal insulin tolerance test (ITT) was performed in animals that had been fasted for 6 h. After measuring basal blood glucose concentration from the tail vein, 0.75 U/kg insulin was injected followed by monitoring of the blood glucose concentrations after 15, 30 and 60 min. An intraperitoneal glucose tolerance test (GTT) was performed in overnight-fasted mice. Blood samples were drawn from the tail vein before injecting 2 g/kg glucose and after 15, 30, 60 and 120 min. Blood glucose concentrations were measured using a glucose meter (Accu-Chek, Roche, Basel, Switzerland) and insulin concentrations were measured by ELISA (Chrystal Chem, Downers Grove, IL, USA). Plasma IL-6, IL-1β and monocyte chemoattractant protein-1 (MCP-1) were detected using a custom cytokine/metabolic multiplex assay (Meso Scale Discovery, Gaithersburg, MD, USA). Mice were anaesthetised by isoflurane inhalation and exsanguinated. The pancreases were dissected and weighed. For immunohistochemistry the pancreas was fixed by immersion in a 4% (vol./vol.) paraformaldehyde solution. For islet isolation the pancreases of six to eight mice were pooled and digested using 3 mg/ml collagenase (Sigma-Aldrich, St Louis, CA, USA) in RPMI 1640 medium (Invitrogen, Carlsbad, CA, USA) supplemented with 2 μg/ml DNAse I (Pulmozyme, Roche) and shaken at 37°C for 15–18 min until a homogeneous digest was obtained. The digest was then washed three times with cold RPMI medium supplemented with 10% (vol./vol.) heat-inactivated FCS (Bodinco, Alkmaar, the Netherlands) and penicillin/streptomycin (100 U/ml and 100 μg/ml, respectively; Invitrogen). Islets were purified from exocrine tissue by manual selection picking under a dissecting microscope. A glucose-induced insulin secretion test was performed on freshly isolated islets. Groups of ten islets were incubated in a modified Krebs-Ringer bicarbonate buffer with HEPES (KRBH) containing 115 mmol/l NaCl, 5 mmol/l KCl, 24 mmol/l NaHCO3, 2.2 mmol/l CaCl2, 1 mmol/l MgCl2, 20 mmol/l HEPES and 2 g/l human serum albumin (Cealb, Sanquin, the Netherlands), pH 7.4. Islets were washed and pre-incubated with KRBH buffer containing 2 mmol/l glucose for 1.5 h at 37°C. They were then incubated in 2 mmol/l glucose KRBH buffer for 1 h at 37°C and switched to 20 mmol/l glucose KRBH buffer for 1 h at 37°C. Supernatant fractions were kept for determination of insulin concentration by ELISA (Mercodia, Uppsala, Sweden). Islet cells were lysed by sonication in distilled water. Islet insulin content was measured by acid ethanol extraction followed by ELISA (Mercodia). Islet DNA content was determined by Quant-iT PicoGreen dsDNA kit (Invitrogen). In order to obtain representative samples of the entire organ, pancreases from each mouse (six per group) were cut into three pieces (duodenal, gastric and splenic region)  that were embedded in paraffin blocks and sliced into 4 μm sections. For each analysis two to four sections per block, with an interval of at least 200 μm between sections, were immunostained and analysed. The average of the three regions was taken as a measure for the entire organ. For the identification of beta cells, nine to twelve sections per mouse pancreas were immunostained with guinea pig anti-insulin IgG (Millipore, Billerica, MA, USA) or rabbit anti-insulin IgG (Santa Cruz Biotechnology, Santa Cruz, CA, USA) for 1 h followed by horseradish peroxidase (HRP)- or alkaline phosphatase-conjugated secondary antibodies for 1 h. Alpha cells were identified by immunostaining by rabbit anti-glucagon IgG (Vector Laboratories, Burlingame, CA, USA) for 1 h followed by HRP-conjugated secondary antibody for 1 h. Sections were developed with 3,3′-diaminobenzidine tetrahydrochloride (DAB) or Liquid Permanent Red (LPR; Dako, Glostrup, Denmark) and counterstained with haematoxylin. Stained sections were digitally imaged (Panoramic MIDI, 3DHISTECH, Budapest, Hungary). Beta cell and pancreas areas stained with haematoxylin were determined using an image-analysis program (Stacks 2.1, LUMC, Leiden, the Netherlands), excluding large blood vessels, larger ducts, adipose tissue and lymph nodes as previously described . Beta cell mass was determined by the ratio of beta cell area to pancreas area multiplied by the pancreas weight. Beta cell cluster area was determined as the average area of beta cell clusters (defined as ≥4 beta cells per cluster) per mouse. Alpha cell mass was determined by calculating the ratio of alpha cell area to beta cell area per islet, using ImageJ software (ImageJ, US National Institutes of Health, Bethesda, MD, USA), multiplied by the beta cell mass. To label proliferating beta cells, mice were given 50 mg/kg BrdU (Sigma-Aldrich) subcutaneously twice daily during the entire period for the 1 week study and the final 7 days for the 6 week study. Sections were double stained for insulin-LPR and BrdU (BrdU staining kit, Invitrogen). Stained sections were digitally imaged (Panoramic MIDI). BrdU-positive beta cells were assessed as a proportion of all beta cells. Pancreatic duct cells were identified based on their typical morphology and location. The number of BrdU-positive duct cells was counted. The number of BrdU-positive acinar cells was counted using Stacks 2.1 and expressed as a percentage of the total number of acinar cells. The area in which these were counted was divided by the total number of cells as a measure of acinar cell size. Apoptotic beta cells were identified by the TUNEL technique (Roche) in combination with insulin immunostaining and were counted. The investigator was blind to the experimental conditions during counting. Data are presented as mean±SEM. Statistical calculations were carried out using GraphPad Prism 5 (GraphPad Software, San Diego, CA, USA). The statistical significance of differences was determined by two-way ANOVA, followed by Bonferroni’s multiple comparisons test, as appropriate. p < 0.05 was considered statistically significant. Liraglutide treatment for 6 weeks was associated with decreased body weight and increased insulin sensitivity in both control and HFD-fed mice (Fig. 1a–c). After a glucose load, liraglutide treatment attenuated the peak glucose concentration induced by HFD at 30 min (Fig. 1d), but this did not reach significance for the AUC for glucose (Fig. 1e). In mice on a normal diet there was no significant difference in glucose concentrations after liraglutide treatment (Fig. 1d). In both liraglutide-treated groups the early response of insulin secretion during the GTT was increased to a similar extent as in HFD-fed mice (Fig. 1f, g). After 6 weeks, pancreatic weight was significantly greater in liraglutide-treated mice (Fig. 2a), despite the decrease in body weight (Fig. 1a). Therefore, we analysed the effect of liraglutide treatment on the exocrine pancreas. Treatment with liraglutide was associated with an increased size of acinar cells in control mice (Fig. 2b). We counted 13,441 ± 439 acinar cells per mouse. The number of proliferating acinar cells was 65% higher in liraglutide-treated control mice (Fig. 2c, d). A similar effect was observed in liraglutide-treated HFD-fed mice, though the difference was less prominent. No significant difference in the number of proliferating duct cells was observed between the groups after 6 weeks of treatment (528 ± 28 duct cells were counted per mouse; Fig. 2e, f). Assessment of pro-inflammatory cytokine plasma concentrations (IL-1β, IL-6 and MCP-1) showed no significant differences between the groups (electronic supplementary material [ESM] Fig. 1). Beta cell mass, determined by analysing 94.9 ± 4.7 mm2 pancreatic tissue per mouse, was reduced in control and HFD-fed mice after treatment with liraglutide for 6 weeks (Fig. 3a). This was associated with a decreased average beta cell cluster area (Fig. 3b). Liraglutide treatment did not affect insulin content in freshly isolated islets (Fig. 3c). No difference in the number of apoptotic beta cells was found between groups after counting 1,129 ± 170 beta cells per mouse (Fig. 3d). To determine the number of proliferating beta cells 1,807 ± 128 cells per mouse were counted. Liraglutide treatment in both control and HFD-fed mice was associated with a lower number of proliferating beta cells after 1 week, but after 6 weeks no difference was observed (Fig. 3e–g). Similarly, the alpha cell mass was reduced in liraglutide-treated control mice. The lower alpha cell mass in HFD-fed mice was unaffected by liraglutide treatment (Fig. 3h). The ratio of alpha to beta cell area did not change significantly between the groups (Fig. 3i). Finally, in order to investigate whether 6 weeks of liraglutide treatment had specific effects on beta cell function in the presence of a reduced beta cell mass, we assessed glucose-induced insulin secretion in isolated islets. Basal insulin secretion (2 mmol/l glucose) was increased twofold in islets from liraglutide-treated control mice (Fig. 4a). Glucose stimulation of islets from liraglutide-treated control mice resulted in a 35% increase in insulin secretion (Fig. 4a). As expected, glucose stimulation of islets from HFD-fed mice led to increased insulin secretion compared with mice fed regular chow (Fig. 4b). This glucose stimulation was unchanged in HFD-fed mice that had been treated with liraglutide for 6 weeks (Fig. 4b). The effect of GLP-1-based therapy on insulin secretion from beta cells has been reported to be glucose dependent [17, 18, 19], but its effect on beta cell mass under different glycaemic conditions is less clear. While GLP-1RA treatment increases beta cell mass in animal models of diabetes, we now show a reduction in beta cell mass in normoglycaemic mice. GLP1-RA treatment of non-diabetic obese individuals results in weight loss and improved beta cell function [12, 13]. Therefore, it is relevant to understand how beta cell mass adapts during GLP1-RA treatment under normoglycaemic conditions and different dietary situations. So far, few studies have investigated the effect of GLP-1RA in non-diabetic animals and showed either no difference or an increase in beta cell proliferation after short-term treatment for between 2 and 10 days [6, 20, 21, 22]. Liraglutide treatment for 6 weeks resulted in decreased body weight and increased insulin sensitivity in normoglycaemic mice and HFD-fed mice, in line with earlier studies [23, 24]. In addition, the increased early response of insulin secretion during the GTT in liraglutide-treated mice is in line with the working mechanism of GLP-1 [25, 26]. This was associated with a major reduction in beta cell mass in both control and HFD-fed mice. The lower beta cell proliferation rate that we observed in mice treated for 1 week suggests that the beta cell mass adapted rapidly after the start of liraglutide treatment. Interestingly, we also show that alpha cell mass was reduced to such an extent that the ratio of alpha to beta cells remained unchanged. Acute GLP-1R stimulation of beta cells is known to increase insulin secretion in a glucose-dependent manner [17, 18, 19]. We show that sustained GLP-1RA treatment during normoglycaemic conditions is associated with increased insulin secretion from isolated islets even in the absence of direct GLP-1RA stimulation in vitro. In HFD-fed mice, liraglutide treatment increased insulin sensitivity, but the enhanced insulin secretory response remained. Together these data suggest that liraglutide treatment in normoglycaemic mice leads to increased insulin sensitivity and an enhanced insulin secretory response from existing beta cells, thereby reducing the need for new beta cells. In addition, these data imply that chronic GLP-1RA treatment during normoglycaemia results in an increased beta cell function as was shown in non-diabetic obese individuals . In contrast, GLP-1RA treatment does not increase beta cell proliferation during normoglycaemia. Finally, we observed increased acinar cell proliferation after liraglutide treatment indicating that this effect can occur during normoglycaemia. There was a non-significant difference in duct cell proliferation after 6 weeks of treatment. These observations and the findings of other studies [27, 28, 29, 30, 31, 32] raise the issue of whether GLP-1-based therapies are a potential risk for pancreatitis; some studies did not observe this effect [33, 34], however, which may reflect the animal model used, the age of the animals and/or the labelling and counting methods used for proliferating cells. In our study, there was no indication of a systemic inflammatory state. Ductal proliferation is also associated with the development of pancreatic adenocarcinoma but the relationship between GLP-1-based treatment and the development of new pancreatic malignant lesions is not clear . In conclusion, our data indicate that GLP-1RA under normoglycaemic conditions can have different effects on pancreatic islet and non-islet cells. GLP-1RA treatment during normoglycaemia results in a reduction in beta cell mass, whereas it exerts proliferative effects on the exocrine pancreas. This work was supported by the Diabetes Cell Therapy Initiative consortium, which includes the Dutch Diabetes Research Foundation, and an unrestricted research grant from Novo Nordisk. JHE contributed to the conception and design of the study and the acquisition, analysis and interpretation of the data and drafted/revised the article. HAMT, MJAWvM, NdG and MAH contributed to the acquisition of the data and drafted/revised the article. TJR, FC and EJPdK contributed to the conception and design of the study, the analysis and interpretation of the data and drafted/revised the article. All authors gave final approval of the manuscript to be published.